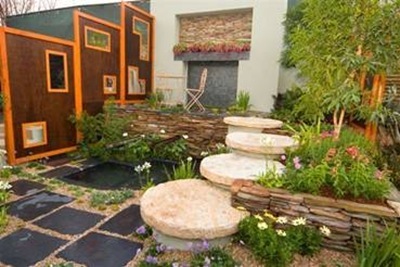 The basic design elements of this garden introduce square and round shapes constructed at different levels to create a dramatic effect. Various natural materials are used, from sandstone to glass and wood to metal. Water adds much needed sound and movement to this enclosed space. 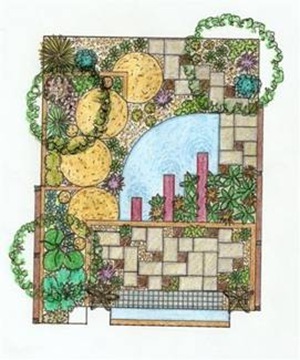 Plant design shows a soft planting using a variety of shapes, forms, textures and colours to unify all the elements of this landscape. Focal plants: Alocasia, Asparagus, Bloody Sorrel. Shrubs and perennials: Aristea, Zantedeschia, ArgyrantheMum, Dianella, Penstemon, Scabiosa, Strobilanthes, Oxalis, Gazania, Zygocactus.